But the extent of clean energy investments is still trifling, according to analysts. 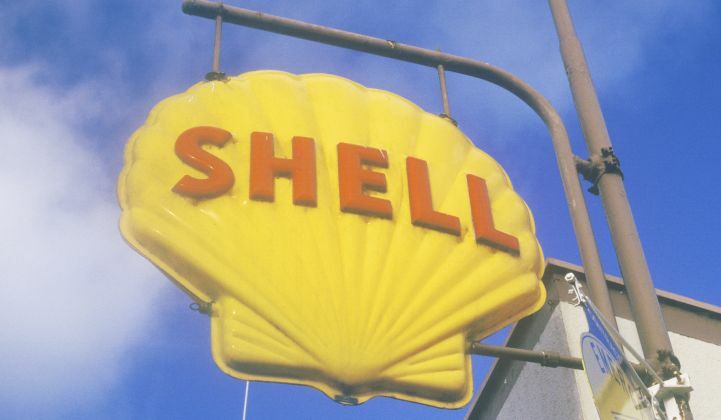 Oil giant Royal Dutch Shell thinks oil prices will be "lower forever." And it's looking to transform itself to meet the challenge by investing further in renewables. According to Reuters, Shell and Japanese telecom giant SoftBank were among potential bidders for Asia’s largest independent renewable energy producer, Equis Energy of Singapore, just two days before the oil major unveiled a strong surge in year-on-year quarterly earnings. Equis is valued at $5 billion. Shell CEO Ben van Beurden told investors the company is “transforming...through the reshaping of the portfolio, as well as through structural changes in our culture and ways of working." Reuters did not say whether the Equis deal, if it goes ahead, would be handled through Shell’s New Energies division, which was set up last year to develop opportunities in new fuels, renewables and digital platforms. New Energies ventures to date include a 50 percent stake in Brazilian biofuels firm Raízen and 400 megawatts of wind generation in the U.S. and the Netherlands. In addition, a New Energies venture capital arm, Shell Technology Ventures, is backing startups such as Sense, a home energy platform developer, and GlassPoint Solar, which makes concentrated solar power plants for enhanced oil recovery. New Energies is aiming to spend $1 billion a year through the end of the decade. Furthermore, a look at the numbers shows that Shell, like its industry peers, is very much still committed to exploiting fossil fuel reserves, according to Paul McConnell, a principal analyst in the global markets team at GTM’s parent company Wood Mackenzie. In the last quarter alone, for example, Shell made a profit of $3.6 billion on a turnover of $11.3 billion. The company managed to generate $38 billion in cash flow from operations in the last 12 months, even with an average oil price of less than $50 per barrel, van Beurden told shareholders this month. "Finding that synergy between the legacy business and the new business is not particularly easy,” he added. Indeed, oil and gas majors have a checkered history when it comes to clean energy investments. Shell, BP, Chevron and Total all piled into solar ventures in the early days of PV, for example. But by 2014 all of the oil majors, except Total and Statoil, had pulled out again. More recently, oil firms have been trying their luck with energy storage. In May, Total bought the battery maker Saft Groupe for $1.1 billion. The same month, ExxonMobil struck a deal to work with FuelCell Energy on fuel cells that could help with carbon capture and storage. Norwegian state-owned oil firm Statoil, which is pioneering the development of offshore wind farms on floating platforms, is also planning to invest in energy storage, along with renewables, efficiency and smart grids, through its Statoil Energy Ventures arm. The investments are part of a wider move to embrace renewables, now that oil companies view them as an unavoidable feature of the energy landscape, according to a recent Wood Mackenzie report. Earlier this month, Shell entered an agreement to buy MP2 Energy, a U.S.-based energy supplier with a 1.7-gigawatt portfolio that includes 30 megawatts of landfill gas, 30 megawatts of large-scale solar, 550 megawatts of wind, 70 megawatts of natural gas plants, and 40 megawatts of distributed solar.